The result of Criminologist Licensure Examination is posted online in the PRC’s official website on November 26, 2014. The list of passers, top 10 exam takers and top performing schools announced by the PRC will be available in this site for easy access. The test was made by the Board of Criminology consisted of Hon. Lourdes W. Aniceto, Chairman and Hon. Ernesto V. Cabrera, Member. The examination was given last October 19-21 in manila and other various testing sites. Most of the examinees came from Manila while Baguio comes second with the number of test takers. 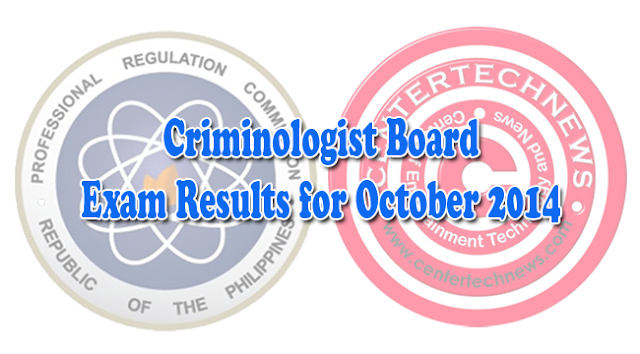 PRC had earlier released a statement that the October 2014 Criminologists board exam result was ased on November 26, 2014, exactly 30 days after the test was given. Baguio Regional Office on the other hand, had said that the result will be out 15 days after the test. It was on 2013 when the Criminologist Licensure Examination result was finally posted online after 16 working days after the test. Earlier this year, April 2014 the result was released quickly, it only took them 9 working days. With 13,873 who took the licensure test, only 4,688 was able to successfully gain a privilege to have the license. For the 34th time, University of the Cordilleras was able to celebrate being the top performing school having 99 percent of passing rate. Aside from the list of passers, topnotchers and top performing schools, PRC will also post the schedule of when the passers can register themselves and their profession in PRC office to have their PRC license and Certificate of passing. Those who had successfully passed must bring their oath form, latest cedula (Must be dated 2014), a passport sized photo with white background and name tag and 2 sets of metered stamps. The awaited list of passers for October Criminologist Licensure Examination will be posted online on November 26, 2014.